North Paramatta Vinnies volunteer Brett Guerin and Western Sydney Local Health District health promotion officer Louise McKeon show the community how healthy cooking can be fun and easy. Mount Druitt Vinnies customers have had their taste buds tingled at a cooking demonstration to encourage healthy eating. Acting St Vincent de Paul Parramatta Central Council executive officer Kate Whitely said Vinnies staff and volunteers came up with the recipes. “They’re affordable, healthy and easy to make and they taste good which is really important to our customers,” Kate said. The event was part of a partnership between the Western Sydney and Nepean Blue Mountains Local Health Districts, St Vincent de Paul and its Parramatta Central Council. 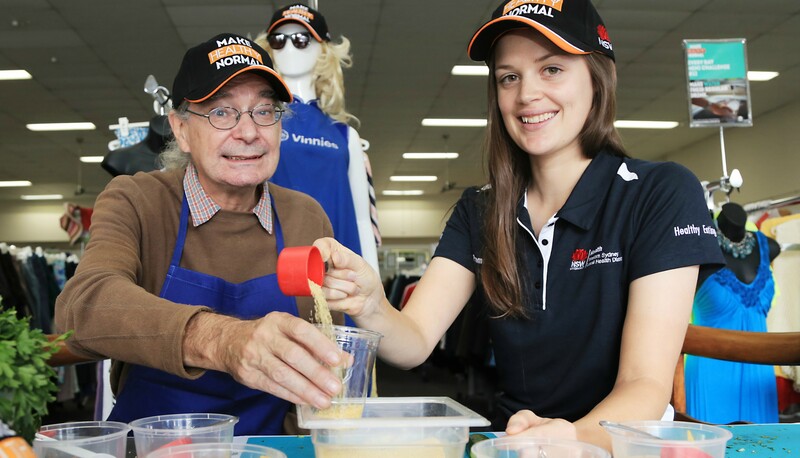 Vinnies stores are run by the St Vincent de Paul Society which was established to assist people in need. Vinnies shops provide the community with affordable and pre-loved items. Starting today, Vinnies staff will hand out free healthy recipe cards to customers for the next six months at 21 Vinnies stores in Western Sydney. They will also be available on thepulse.org.au. Trained health promotion volunteers will also be on hand at Vinnies stores in North Parramatta, Mount Druitt, the Blacktown Mega Centre and Springwood to provide information about the free Get Healthy telephone coaching service, an initiative of NSW Health’s Make Healthy Normal campaign. Vinnies volunteer Brett Guerin, Vinnies customer Mandy Ryan, volunteer Gino Scaccabarrozzi and customers Abid Iqbal and Alisson Johnston. Western Sydney Local Health District population health director Christine Newman said the project helps people understand how easy it is to prepare healthy meals. “Unhealthy food is often faster and easier to obtain, especially with time pressures,” Christine said. “Yesterday’s cooking demonstration and the recipes show the community that it’s actually very easy to whip up a quick, affordable and nutritious meal. “Our partnership with Vinnies demonstrates how services can work together to improve health outcomes for those who may need an extra hand. The healthy eating initiative is phase two of the Make Healthy Normal campaign in Western Sydney and the Nepean Blue Mountains. The project received a Zest award in 2017. In 2017-18, the NSW Government committed $31 million to reduce the prevalence of overweight and obesity in NSW, $19 million of which has been allocated to the delivery of the Premier’s priority to reduce childhood overweight and obesity. If you would like some one-on-one help to get your family’s healthy eating on track, sign up for your free telephone coach, by visiting makehealthynormal.nsw.gov.au.